Over the last six or seven years, I’ve been wrenching on cars almost non-stop. But since I don’t have any formal training, I’ve hurt myself quite a few times. I’ve cut myself on rusty sheetmetal, squirted battery acid in my eye, and set lots of stuff aflame. All of these mistakes are common—but they can be avoided. There are lots of aspects of automotive repair that can seem intimidating at first. You’ve got to decide which jobs to tackle first, figure out how to do those jobs, and know which tools to buy without spending too much money. And then there’s the issue of safety. But done correctly, wrenching can be almost as safe as any other hobby. Through my own literal trials by fire, here’s what I’ve learned about keeping a car running without losing any appendages. Appendages tend to be things you want to hang on to. What Parts Of A Car Are Most Dangerous? A Chrysler 8.25 axle lurks in the grass. 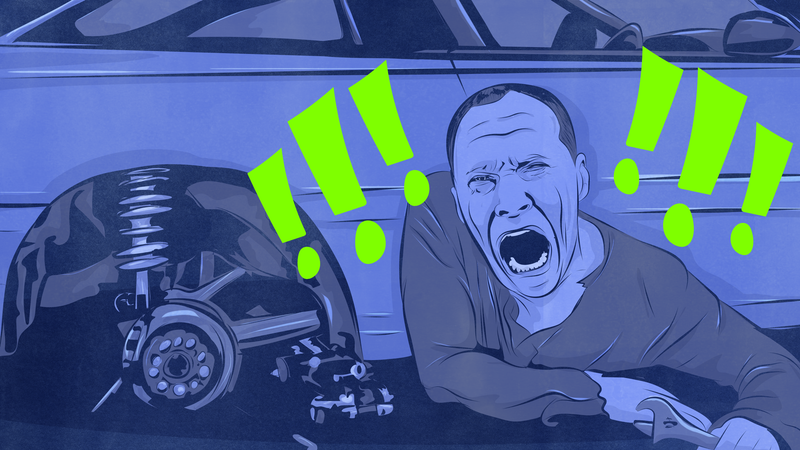 Before we get into actual safety tips, let’s talk about some dangerous parts of your car—things to remain cognizant of while wrenching. The most obvious danger while working on a car is the sheer heft of its parts. First there’s the car itself, because not surprisingly, it would be very bad if it fell on you while you’re underneath it. Lots of smaller bits on your car (particularly those on older cars) are made of steel and can be far heavier than they look. The last thing you want to do is unbolt a part from underneath, only to be pinned to the ground as you struggle to lift it off your helpless body. There’s also the danger of the metal bits that move. That mechanical fan rotating with your engine, for example, is a prime phalange-cutting instrument, and even a timing chain can catch a shirt sleeve and turn your arms into ground beef. In addition, there are energy-storing parts like springs (coil springs) and pressure vessels (like fuel rails) that can erupt violently in an effort to reach a lower energy state. You definitely want to be careful with those. Another thing to look out for, especially if you live in a place that uses lots of road salt, is rust and other sharp metal parts. Tetanus infections are no joke, and if you don’t have your shot, you might want to go get one. A bucket of mostly coolant and traces of automatic transmission fluid. Then there are the fluids, which perhaps pose an even bigger hazard than the big metal bits. Used motor oil is a proven carcinogen and should be kept away from your skin, ethylene-glycol (engine coolant) and brake fluid are basically poisons that can cause kidney failure if ingested, and windshield washer fluid contains methanol, which can cause all sorts of neural issues. Not to mention there’s the carbon monoxide from your engine’s exhaust, which can lead to brain damage or death, gasoline which is highly flammable and—along with refrigerant—can cause asphyxiation, lung damage, or brain problems if inhaled. Plus, there’s sulfuric acid in your car’s battery, which you don’t want anywhere near your epidermis, eyes or especially your mouth, lest you sustain burns, blindness or internal organ failure. A typical 12 volt car battery. Oh, and besides getting crushed, cut, infected, poisoned, burned, blinded and asphyxiated, there’s also the risk of getting shocked. The good news is that, unless you’ve got wet hands, touching your car’s battery posts is not likely to shock you due to your body’s high internal resistance. But that doesn’t mean your typical 12-volt battery isn’t dangerous. Just a few weeks ago, I burned the crap out of my hand while cooking meat under the hood of my Jeep. I was holding a dangling piece of aluminum wire that made contact with the positive battery post and with a ground. Due to what nerds call “I^2R losses,” that wire turned the battery’s current into heat, and the little bit of aluminum instantly reached temperatures otherwise only found in the fieriest pits of hell. So after reading all that, you probably think you need to wear a helmet and full, insulated body armor to keep from getting killed while wrenching, but staying safe while fixing your car is actually fairly simple. Now that you know what sorts of things to look out for, here are some tips and tricks to keep yourself safe. Keep in mind, this isn’t an exhaustive list, but just some good tips for first-time wrenchers. Try to wear gloves as often as possible while wrenching. The easiest way to keep oil, coolant and fuel off your skin is to wear gloves. Disposable latex gloves are great for keeping fluids off your hands but don’t do much to prevent cuts or bruises. That’s why I wear a regular set of nylon and leather gloves; they’re not waterproof, but they still keep oils off me, and they keep my knuckles intact. I also wear coveralls, which not only keep fluids off the rest of my body, but they also keep my clothes clean—a good thing, because much of my wardrobe was starting to smell like 10w-30. It’s worth mentioning that wearing loose clothing can be risky, as you might catch a sleeve in a timing chain sprocket or some other moving part. The arms on my coveralls have little rubber bands in them, keeping my sleeves from dangling, so try to make sure whatever you wear isn’t sagging all over the place. Always use jack stands when lifting a car. Your car probably came with a bottle jack or scissor jack, and while those are compact and convenient, they’re also highly unstable. Floor jacks are much safer options, as they are less likely to tip over. Just make sure the one you’re using is rated for your vehicle’s weight, and make sure it’s in good condition (i.e. not leaking). Once you’ve got the floor jack lifting from your car’s designated jack point— a special, reinforced area of the body that can be looked up in an owner’s manual— lower the car onto a jack stand like the one in the image above (again, make sure the jack stand is rated to hold your car’s weight). It’s also always a good idea to keep the hydraulic jack under the car as a secondary safety measure in case the jack stand fails. If you don’t have a jack stand on hand, slide your wheel under the car. That way, if your jack fails, you’ll at least have something keeping the car from crushing you. Never take off a radiator cap when the engine is still hot. One of the most classic safety blunders a shade-tree mechanic can make is loosen the radiator cap while the engine is still hot. Turning off the engine may get rid of the primary heat source, but thermal mass means the coolant will remain hot long after the motor stops firing. The radiator will remain pressurized until the coolant’s temperature drops, so removing the radiator cap with a hot engine will result in an event akin to a geyser eruption. Hot coolant will pour all over your hands, burning them severely. This idea of “thermal mass” holds true to other under-hood components like the engine block, catalytic converter and even the transmission. It’s not fun trying to wrench near extremely hot surfaces, so, for god’s sake, wait a few hours after your car has cooled down wrench on your car. Disconnect the negative battery terminal when working on electrical components. I already mentioned the pain I felt when a piece of aluminum wire I was holding made contact with my car’s battery. What I should have done is either put a non-conducting piece of plastic or wood over the battery, or simply disconnect the negative battery terminal. Many repair manuals will recommend disconnecting the negative terminal on almost any under-hood repair job, so that’s always good advice. It’s also a good idea to avoid wearing jewelry like wedding rings while wrenching, as those can act like that piece of wire I was holding, turning your battery’s current into heat, and causing a nasty burn. Lifting a heavy component like this transfer case by yourself could be rough. If you’re going to be lifting heavy stuff, steel-toed boots are a good call. But those aren’t going to prevent you from tweaking your back or pinning yourself to your garage floor. So if you’re not sure how much a part weighs, look it up online (consulting forums is often a good idea). I once loosened a starter motor from underneath, and severely underestimated its heft (it weighed nearly 10 pounds). The starter fell through my outstretched hand and nearly turned my face into a pancake. I later read multiple forum posts warning that this could happen. So use the internet to turn other people’s mistakes into your gain, or, better yet, just take the safe route and call a buddy for help. That’s a key rule for wrenching: if you need a hand, don’t be afraid to ask for it. If you’re working on a car, wear eye protection. Every time. It doesn’t matter if your car is from Arizona and doesn’t have a spec of rust, dirt and grime will hide under your car, and as soon as you try to break that driveshaft u-joint strap free, that dirt will dive-bomb right into your eyeball. If you’re working with any sort of power tool, particular one that cuts or grinds, metal shards will fly everywhere. Metal in your eyeball? That’s no fun. But it’s not just dirt and metal you’re worried about. I’ve sprayed brake cleaner in my eyes multiple times, and it is excruciatingly painful. What wasn’t painful, but really scary—as I could have lost my vision—was when battery acid sprayed into my eye when I accidentally squeezed my motorcycle battery acid refill bottle. I quickly rinsed my eye, and all has been well, but it wouldn’t have been an issue if I had just been wearing eye protection in the first place. Put a pipe on the end of your wrench for more leverage. Gloves are a great way to keep your knuckles from getting bruised, but what’s better is not having to put all your might on your ratchet to begin with. The solution: a large lever arm. To twist any bolt free, you need torque, which is just a product of a force and the length of a lever arm. In other words, you can exert a lot of force on a short lever, or a little force on a long lever, but torque will be the same. The issue is, when that nut or bolt does break free, if you’re doing the “high force-small lever” approach, all that force your arm is exerting is all of a sudden unchecked. Force is mass times acceleration, so the mass that is your hand is going to accelerate like a rocket ship. Better to just use a longer lever arm and less force. Another good tip is to pull a ratchet towards you instead of pushing it away from your body, as you’re better able to control your hands once the bolt breaks free if you’re pulling towards your chest. Don’t let your garage look like this. A cluttered garage is a recipe for disaster. The last thing you want to do while carrying an 80 pound cylinder head is slip on a wrench you left lying on the floor. You need to keep your tools and parts organized, and try to avoid laying them on top of your car or in your engine bay, because you don’t want tools falling off your car and hitting you in the head, and you don’t want them getting caught among your vehicle’s moving parts. Keep your tools and parts organized, otherwise you’re just asking for trouble. To keep your car from rolling, throw a block of wood behind your wheel. Always be cognizant of which wheels are still on the ground, and whether those wheels have the capacity to keep your vehicle from rolling. For example, if you own a rear wheel-drive car, realize that when your car is in park, the only thing keeping it from moving are those rear wheels, which are being held firmly by the parking pawl or park brake. If you lift those rear wheels to do a brake job, for example, and you’re on an incline, your vehicle will almost certainly roll. So to prevent that, throw some wheel chocks (or a piece of wood) on either side of your front tires. Anytime you think your car might be at risk for rolling, just put a chock under the wheel. Runaway cars are no fun. Always have a fire extinguisher nearby when working on fuel systems. If you’re just learning to work on cars—especially carburetors and other fuel system components— fires just sort of happen. I’ve set two carburetors on fire in my seven years of wrenching, and I’ve nearly burned a motorcycle to the ground. One of the three times, I had to resort to baking soda to extinguish the flame, but the other two, I was prepared with a fire extinguisher. But it’s not just any fire extinguisher, it’s one rated for fuel and electrical fires. In addition, it’s worthwhile to have a carbon monoxide alarm in your garage. I’ve set mine off multiple times thinking I had the garage door cracked enough to start the car. I did not. It’s also a good idea to have a first aid kit nearby or at least in your house. Just in case. Be careful where you use a torch. If you’re working around fuel systems, be very careful. Often times, fuel-sending units are held into fuel tanks with retaining rings. When you try to knock those loose (or anytime you need to hammer something near a fuel source), use a brass punch and not a steel one. Hammering something steel can easily create a spark, and spark plus fuel equals a bad time. Also, whenever you use a torch, keep it away from gasoline, motor oil, brake fluid, penetrating oil, and especially transmission fluid. Not all of these oils are explosive, but they’ll all catch fire. And for god sakes, don’t smoke while wrenching near your fuel supply. It’s not worth burning your car down, and it’s not worth dying. Yellow wires are usually associated with airbag systems. If you’re working on a hybrid or fully-electric car, orange conduits and connectors signify high voltage lines. Stay away from those unless you really know what you’re doing, as getting shocked by high voltage batteries can kill you. Also be aware of yellow wiring, as yellow wires tend to be related to SRS airbag systems. You don’t want to accidentally disable your airbags, and you definitely don’t want to accidentally set them off. If you’re going to use a spray lubricant or paint, make sure you’re in a well-ventilated area. See that can of penetrating lubricant above? That’s Aero Kroil, a substance so vile, a small whiff of it will make you sick for days. Even though it breaks free rusty nuts like it’s nobody’s business, you don’t want to be spraying that anywhere but in a well-ventilated area. Crack a door or window open if you value your brain cells. Paint and other particulates (like asbestos on old cars, or just airborne particles from machining) are good reasons to buy yourself a respirator. You’ve only got one set of lungs—maintain them like you’d maintain a pristine Candy Apple Red 1966 Mustang. There are some things that you may just want to leave to the experts, whether you’re just not confident in your knowledge, or if you just don’t have the tools. High voltage wiring on a hybrid, or an airbag system might be two good examples. Many diesel vehicles have high-pressure fuel systems that, if punctured, can cut right through human flesh, so that could also be another example where you leave it to the pros. If you need to get an alignment, or if you want to remove your AC condenser without dumping refrigerant into the air, those are both decent jobs to leave up to someone else. But it’s all up to you to gauge what jobs you can tackle, and which ones to just let the big-boys do. Breaking out the repair manual and learning how the car works is a great way to stay safe. The single best way to keep yourself safe while wrenching is to understand how your car works, a process that takes time (don’t be put off if you don’t know how it all works, yet). If you follow the steps I mentioned before, you can get up to speed in no time. It’s very important that you understand what might come crashing down once you finish loosening that last bolt, or what parts are going to start moving as soon as you hot-wire that starter motor. Understanding how the components work together as a system is the single best way to keep you out of trouble. This list of safety tips wasn’t exhaustive. I really only mentioned tips for people using hand tools, not welders, compressors, angle grinders and other machines. Feel free to suggest additional safety precautions of your own.